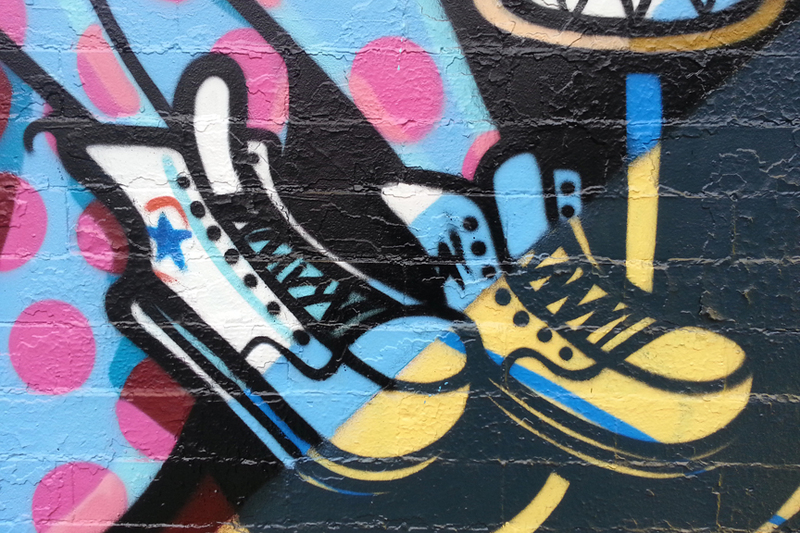 Public Ad Campaign: Jersey Joe (AKA Rime) for Converse? Jersey Joe (AKA Rime) for Converse? 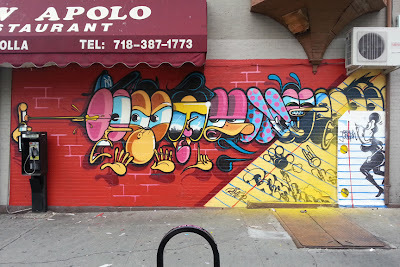 Jersey Joe (AKA Rime) finished a mural yesterday on Grand and Union in Brooklyn. I happened to be walking by while he was painting and asked him a few questions about the mural, including how he came upon painting this location as it is the third mural to go up on this corner over the last few months. Rime explained that it was actually Converse that had obtained permission for the mural to be painted. Normally I am opposed to commercial companies contracting artists to paint "art" murals as the murals usually end up being glorified advertisements in the end. This morning on my way to the studio I walked by the finished mural and was happily surprised to see that despite Converse contracting Rime to paint this mural, there was almost no branding whatsoever. In fact the only branding I could see was the small Converse star painted on the shoes of one of Rimes characters, a detail i might have missed if I wasnt aggressively looking for branding in the first place. This mural raises some interesting questions about commercial collaborations between artists in public space. Can a company sponsor artistic endeavors and refrain from burdening the viewer with the type of one way message associated with brand recognition. If so, can those collaborations also prove fruitful for a company as word of mouth and social networks make potential customers aware that they were in fact responsible for the mural or artwork that we are seeing in public space, engendering a stronger brand loyalty through the recognition of their altruism. If so, what might public space look like if advertising in its traditional form was banned but the un-branded sponsoring of art was an acceptable way for companies to engage the public in public space?